The English language has a bunch of confusing words. Most of them are homophones sharing similar sounds and spelling but with different meanings altogether. Such words as patient and patience fall under this category as they are spelled and sound closely alike. An individual who is undertaking an in-depth or advanced study of the English language may have a better chance of studying differentiating aspects between homophones. However, it never costs a dime for anyone else to familiarise themselves with their variations. After all, we all use them quite a lot and may find them confusing us or even be a source of embarrassment for us. This post seeks to draw the boundaries between the two. It brings out the differences by touching on the definitions, grammatical considerations, as well as the functions of each word in a sentence. Patience is a noun. It can be defined as a human character quality that helps one endure, tolerate, or accept problems, delays, rubbish, mistreatment, or suffering without showing signs of annoyance or anxiety. It also refers to the ability or capacity to be patient. When an individual demonstrates or exhibits patience, they are said to be patient. In that regard, the word patient is used as an adjective. Health workers are encouraged to exercise patience while dealing with patients. The little girl could not exercise patience and wait for the cookies to get ready. She took one while everyone’s attention was diverted. 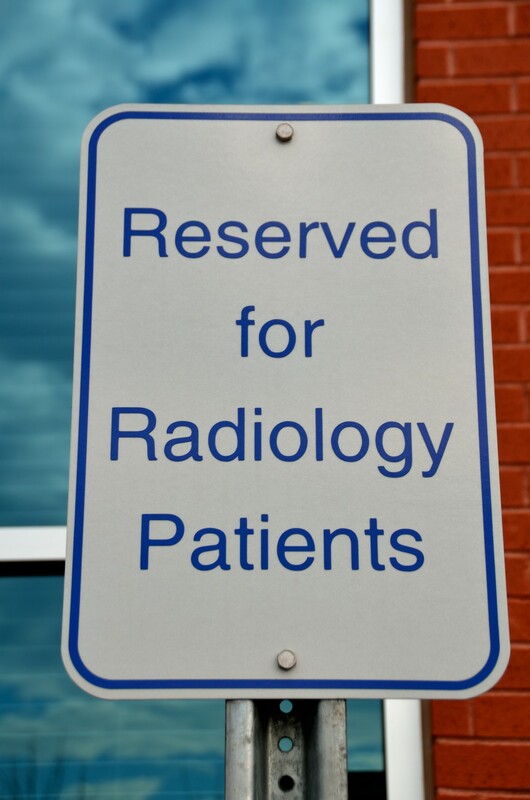 The word patient is used as an adjective that denotes an individual who is amenable to accepting delays and waiting. The individual also exhibits peacefulness and a calm nature. An online source will define patient as the ability to accept or tolerate problems, delays, or suffering without exhibiting annoyance or being anxious. Patient can also be used to refer to someone or animal under or waiting for treatment from a health practitioner. He has been patient with us for a long time. His patience is wearing out now. The patient could not wait for the doctor to come back and release him. His patience ran out, and he decided to run out of the ward. Patience refers to the good-natured exercise of tolerating incompetence or delays while patient is the ability to tolerate incompetence, delays, problems, and suffering. Patience is a noun while patient is both an adjective and a noun. When the word patient is used as a noun, it refers to an ailing person or animal. Patience refers to the ability to endure difficulties, pain, suffering, or provocation with humility and calmness. 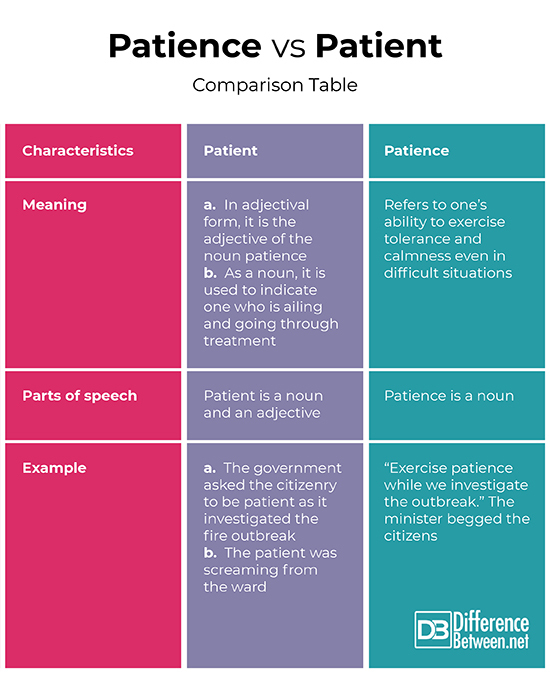 Patient, on the other hand, can refer to an ailing individual or be used to denote an adjective where it refers to someone who has the ability to exercise patience. The only similarity between these two words is the near-similar pronunciation. Their sounding and spelling are very similar safe for the letters at the end of each. The letters draw the main conclusion that they are different. In a bid to use them correctly, it would work out best if you attempted reading them out loud and practicing using them in sentences orally. Sarah Brown. "Difference Between Patience and Patient." DifferenceBetween.net. November 19, 2018 < http://www.differencebetween.net/language/words-language/difference-between-patience-and-patient/ >. 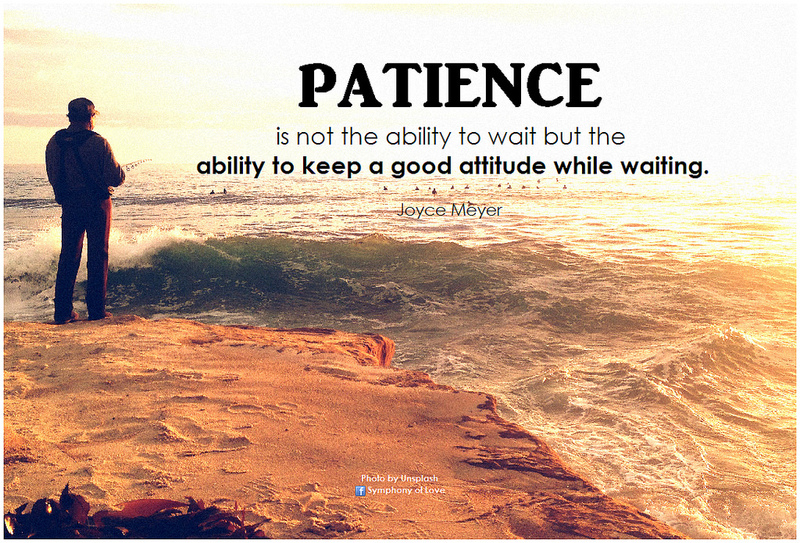 "How To Use Be Patient Or Have Patience Correctly – Grammarist". Grammarist.Com, 2018, https://grammarist.com/usage/be-patient-or-have-patience/. Accessed 22 Oct 2018. Shrives, Craig. "Patients And Patience". Grammar-Monster.Com, 2018, https://www.grammar-monster.com/easily_confused/patients_patience.htm. Accessed 22 Oct 2018.